Boko Haram has denied claims by Nigeria's government that it has agreed to a ceasefire and will release more than 200 abducted schoolgirls. The group's leader, Abubakar Shekau, said the girls had converted to Islam and been married off since being taken. Nigeria's army announced a ceasefire with the militants on 17 October, saying the girls would soon be freed. But violence has continued since news of the alleged truce, including a fatal bomb blast on Friday. 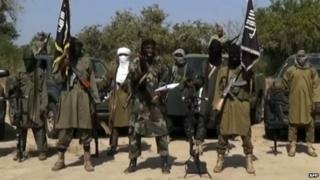 Boko Haram has been fighting an insurgency since 2009, with some 2,000 civilians reportedly killed this year. In a video released on Friday, Abubakar Shekau said: "We have not made ceasefire with anyone. We did not negotiate with anyone. It's a lie. "We will not negotiate. What is our business with negotiation? Allah said we should not." Shekau also claimed that the militants were holding a German national, thought to be a teacher, who was kidnapped by gunmen in July. There was no indication of when or where the group's latest video was shot. The BBC's Tomi Oladipo in Lagos says the video will come as a huge embarrassment for the Nigerian government after it said it had secured a ceasefire with Boko Haram. The Islamist militants sparked global outrage in April by abducting 219 schoolgirls from the remote north-eastern town of Chibok, in Borno state. Their continued captivity has led to criticism of the Nigerian government's efforts to secure their release. Hopes were raised earlier this month when Nigeria's chief of defence staff, Alex Badeh, announced a truce with the group. "They've assured us they have the girls and they will release them," he said. "I am cautiously optimistic." But the Boko Haram leader said the girls were "in their marital homes" after being married off by the group. Last week, Human Rights Watch said in a report that Boko Haram was holding more than 500 women and young girls captive and that forced marriage was common in the group's camps.